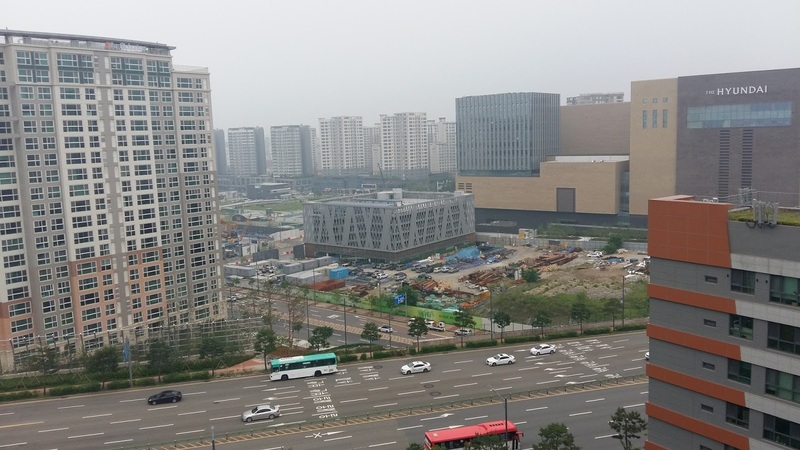 Furianne: Stop & Chat: May 25-30 - Ikea, Insa-dong, Hiking, & More! Wednesday morning T picked me up and we drove to Ikea. There, we walked through the store and found what I wanted to buy. Some of the things I was looking at were still out of stock so I didn't get everything. I picked up a wardrobe and 2 drawer sets to replace some of our older Sterilite drawers that are falling apart. As we loaded up her car, Michael called to inform me that he was done with his work stuff for the day. We decided to go to the house so he could help us unload the car, then go to a local restaurant. I don't know what it's actually called, but we all call it the Duck Restaurant. You can see it in the first picture of this post. The caption for the mini island display that is found in the subway system. The restaurant was pricey, but nice for a treat. It was W49,000 for the three of us. We got a plate with half duck meat, half beef. Once we finished our food at the restaurant, we took a bus to a nearby subway entrance and began our trip to Anguk station, which is our stop for going to insa-dong. At Anguk station in the underground section there was a display of Dokdo, a set of volcanic islands. Michael took the pictures of the model. I think he did a good job! We left the station and walked over to Insa-dong. I've been here once before with T, in February. This time we took the time to show Michael around. There was an entire store dedicated to cat-themed products. My mom would have loved this place! This was a building that spiraled upwards with stores everywhere. A nice seating nook with some trees to enjoy. The view of the main street from the top of the building. Another view of the cat store. I assume it's called Choo Choo? While I was on the top floor, some men on horses came riding by on the street below. As you can see, the street wasn't very crowded. 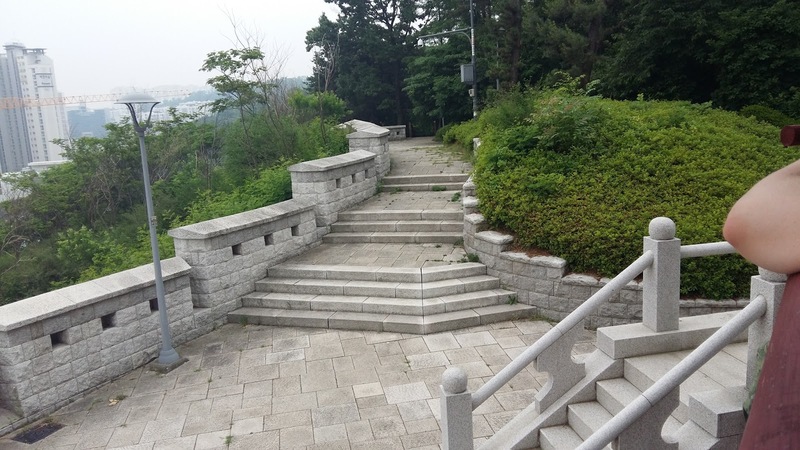 If you go to Insa-dong while visiting Korea, definitely go during the week. This was on a Wednesday at about 3pm. There is a store where you can rent traditional Korean clothing and wear it around Insa-dong. Some people get the opportunity to take pictures and leave their pictures on a wall by the rental location. Michael and I didn't know how long we would be here and we wanted to walk around more, so we didn't rent any clothing. A view of a restaurant from the top of the building. Have I mentioned how much I like the art style? T said this was the.. um... Poopie Store. It's a café with a bunch of poop themed items. Michael and I love toilet humor but T didn't seem to appreciate it as much, so we did not stop by to check it out. 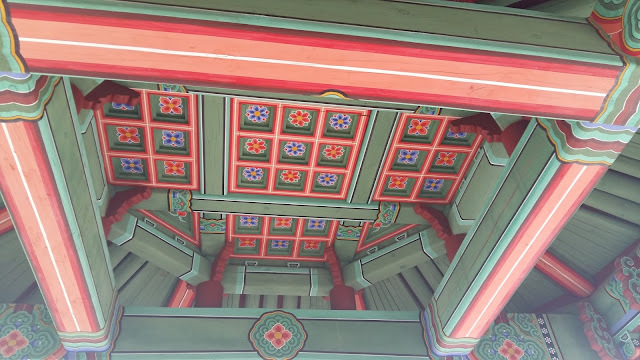 After we were done with the spiral building, T began taking me to all of the different Hanji stores. One thing I have learned from what she has said and my own experience is to buy multiples if you come across something you really love. You never know if that store will still be here the next time you come or if they will still have that color in stock. Anyway, on to pictures of the inside. The wall of Hanji paper. Michael told me to pick up as much as I wanted because the USD to Won conversion was high that day and we didn't want to come back and essentially pay more on a low conversion day. That is one dance that him and I do with our purchases. We take into consideration conversion rates as well as the conversion rate at the time we converted our stash of Won allowance. We try to convert a fair amount of money to use as allowance during high conversion times, so even when the daily conversion rate is low we're paying with money from a high conversion day. Does that make sense? Then there's the gamble on when and if we should convert our rent money to Won. We can pay rent in USD, but if we see a high conversion rate in the middle of the month we try to convert at that time instead of taking the risk of 'losing' money by paying rent during a low conversion time table. It was my obsessive price/conversion math that told me we were overpaying for our 5 gallon jugs of drinking water, which are W5,000 each and we buy from the realtor's office. It is much cheaper for us to go to the commissary on post and get half gallon bottles of water for 37¢ each, and remains cheaper until the conversion rate is 1 USD to over 1300 Won... which we have never seen. One of the shelves in the store. I didn't spend much time looking at it, as these were extra knickknacks more than Hanji supplies. Some strips of cloth that some more skillful Hanji crafters use in their pieces. There were also larger sheets of cloth. T has been to this store several times before, so they know her by name. This was my first time here, and I know why T likes it here so much. The women who work here are wonderfully nice and helpful, quick to offer discounts, and speak English. 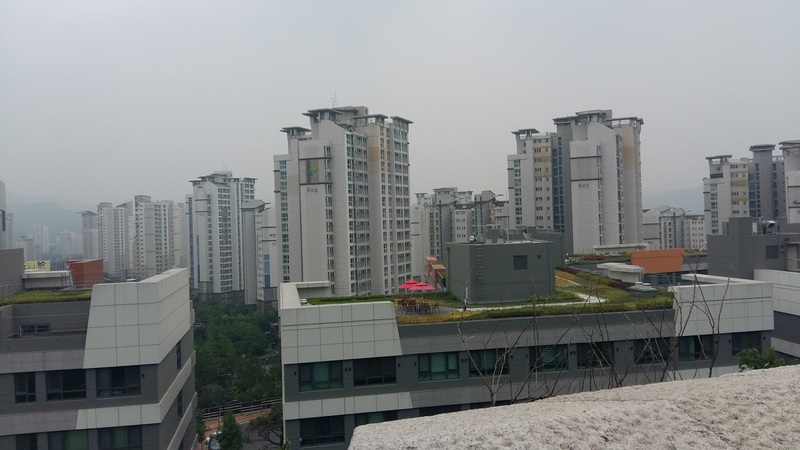 A lot of people in Insa-dong speak English (it's a tourism district, for crying out loud!) but their English is exceptionally good, making it easier for us to communicate about what we want to buy, prices, etc. At this point I know enough Korean to get my point across, but I felt more comfortable fully understanding what I was buying and paying for. Especially since we spent over W100,00 at this store. Hey, I had to stock up on supplies. Up until now I've only used the supplies provided to us at the CAC. Once we finished up at the Hanji store we all decided we were tired and headed home. It was close to 8pm when we walked through the front door. We showered and went to sleep for the night. Thursday I met up with C and L for a midmorning hike. C brought her two pups and L brought her son. The hike itself was fun. We didn't go very far, only about 5 and a half miles, but there was a lot of up and down for those 5 and a half miles. 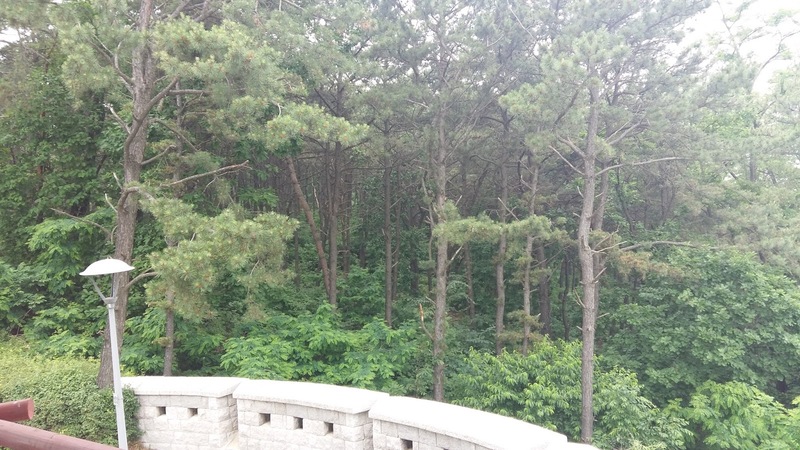 Towards the end of our hike we stopped at a gazebo and enjoyed the semi-lovely view. The forest is where we did most of our hiking. There were trails so we weren't lost, but some times those trails got very thin. The air quality wasn't the best, so our view of the city wasn't that pretty. After our rest we headed back to the cars and met up at a local rice burger place. 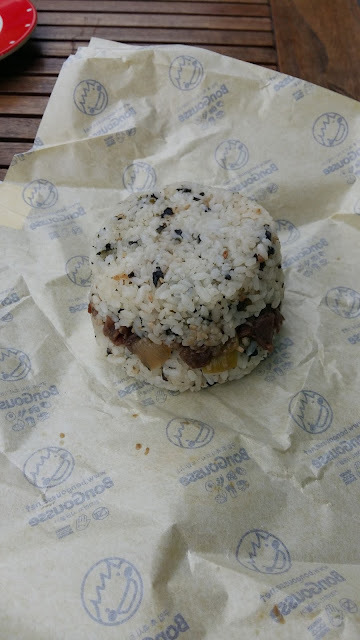 I got a beef bulgogi rice burger. It was really, really good! I'm going to miss all of this food when we move back to the States. This was what C got. A ham & cheese rice burger. The issue she had -and what made me glad I chose to get the bulgogi one- is the 'sauce' used. It was a tuna and mayo concoction. I like tuna and mayo... but with rice, ham, and cheese? No thank you. After we finished our food, C and I stopped by her house to pick up the dogsitting supplies. Then we went to my house, where C helped me set up all of the dog stuff and introduced her dogs to the house they would be staying in for four days. She didn't stay too long as she was getting emotional about leaving them behind. The rest of my Thursday was spent hanging with the pups and letting Michael introduce himself to them. The pups almost immediately fell in love with Michael, sealing our fate for a very fun filled weekend. Sunday was a late day. I didn't wake up until 2pm, with the exception of the couple of times I took the pups out for a walk and potty break. They are small dogs, so they were able to lay with me on the bed or couch and sleep with me without suffocating me. I did go back to K's house with T, as was established during our late night hangout session. This time I was out from 4-8pm. I wanted to get home before Michael left for his shift to see him and make sure the pups were doing okay. T stayed at K's until a little after 10. Once T left, K and I video called and got to hang out. K and I haven't really talked 1-on-1 before. Over the course of our time hanging out with T, we realized that we had a lot in common and used that video session to get to know each other a bit more. Monday was a cleaning day. I started cleaning some of the rooms that the pups didn't need to be in, as well as started on laundry. C came by to pick up the dogs around 4:30, while Michael was at the commissary buying some food for dinner. While he was there he noticed that the beef and ground steak were 50% off and pork was 66% off. We stocked up. LOL. Michael got home shortly after C left and I helped him put away the groceries. From there I started cleaning the house in earnest. The floors were swept and mopped, the couches were cleaned, surfaces were wiped down, dishes were cleaned, linens were washed and dried. While I cleaned, Michael made some lasagna. The lasagna he made was different from typical lasagna. He's not a fan of tomato sauces so his lasagna was made completely without spaghetti/tomato sauce. It still turned out delicious, but I wouldn't call it lasagna :) He invited a friend over and we watched Shrek 1 and 2 together while drinking some wine/beer, eating lasagna, and then making a ginormous cookie. Michael got a huge craving for chocolate chip cookies, so we made a batch and put the entire batch in one pie pan. Because that wasn't enough, Michael and his friend then covered the ginormous cookie in icing and would have added sprinkles if we had any. My point is, our night was very.... hearty. I went to sleep around midnight and woke up shortly before 9. My morning has been spent typing out this incredibly long post. I'm going to try and catch up on my wax posts, as well as finally post my Beezy Tarts haul, but no promises. Michael and I have plans for today. I'm used to gaps in my blog posts happening because I ran out of fuel. Because I lose my inspiration to post. I have never had gaps in posting because I was too busy. That is, until these past few months. Every single time I have not posted, it was because I was genuinely too busy or exhausted to sit down and type out a post about my day, or post my wax hauls/reviews, or do a nail of the day. This is a very weird feeling. I'm two weeks behind on my wax posts. I'm three weeks behind on my haul posts. I don't have pictures of the stuff I want to post because I haven't been able to take said pictures yet. Can I say again how weird this is? I'm happy about it, but oh my goodness I have never been this busy in my life. And I've juggled school, work, a relationship, and friend(s) before! I don't even have work to worry about and I'm more busy than I've ever been in my life. It's such a pain for me to hop on UO from Korea. It reminds me of the OOOOLD UO days, where lag was abundant and you would hop across the screen in choppy movements. I DO want to make a design based off of that shop I saw, though! Maybe on Test Center, just so if I crash/lag out and something is stolen it's not a big deal. Wow!! What a packed week! The cat and poop stores seriously have me wanting to browse. How cool. That paper is so beautiful. I cannot wait to see your haul and what you make with it. I can visualize a really cool ripped paper art piece for framing. Are you using some on your drawers?? I bet you will have serious cravings for all that yummy food. 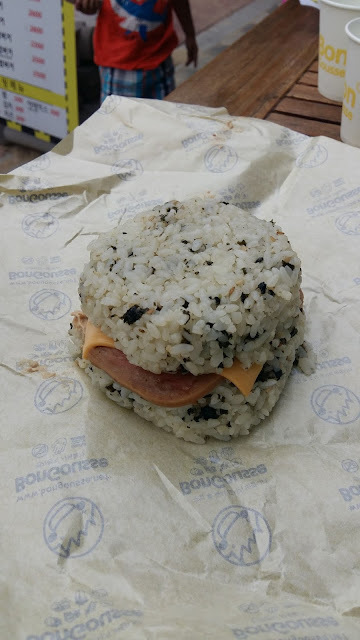 That rice burger! Mmmmmm!!! I learned the other day that poop is viewed as a sign of good luck in Korea, which is why the poop themed items and cafés are so popular! I will definitely be using it on the drawer kit I bought that day! The other one I've been posting about is already done with the paper process, so I can't add it on. I mean... I guess I could... but I've already started the lacquering process. I'm trying to find Hanji suppliers in America... and I'm becoming very sad. At this rate I will have to STOCK UP before we leave just so I can keep crafting!